Industrial applications are wide and varied, incorporating many, if not all of the other applications. 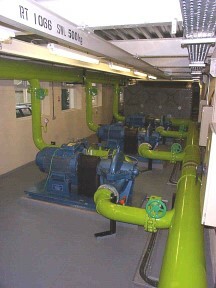 High pressure, high volume water pumps such as those shown are suitable applications for EnviroStart, additionally providing soft-stop control to overcome water-hammer whilst also providing savings. In the shown pump-stack, savings greater than 14% were achieved, giving a payback of less than 18 months.